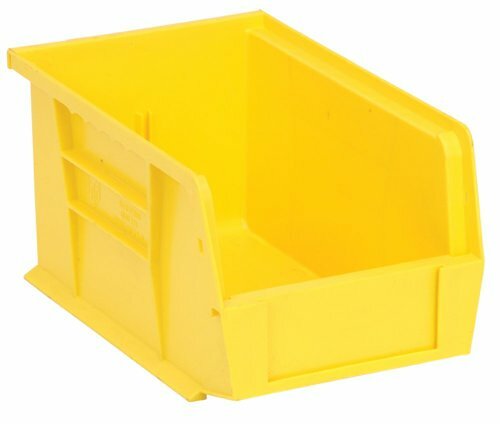 5-3/8" x 4-1/8" x 3", Yellow, Akro Bin, Extra Wide Stacking Ledge Assures Stability For High Stacking, Curved Bottom At The Hopper Front For Easy Retrieval, Can Be Hung, Anti-Slide Stop, Label Stop. 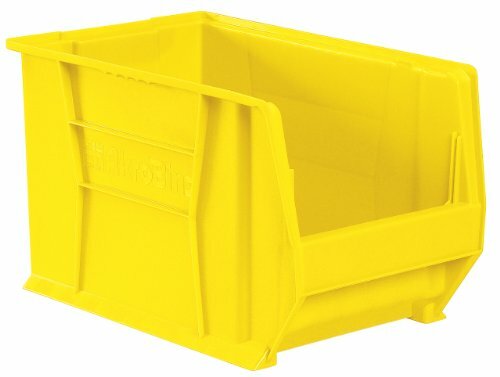 Heavy-duty stacking bin with wide front openings, These bins allow for easy access and greater Visibility. Ideal for home, shop, or garage storage. This product is manufactured in United States. This product meets customer requirement. 30224 AkroBins optimize your storage space. Control inventories, shorten assembly times and minimize parts handling. Heavy-duty polypropylene bins hang from Akro-Mils racks, panels, rails, and carts; securely stack atop each other and sit on shelving. AkroBins are unaffected by weak acids and alkalis. Sturdy, one-piece construction is water, rust and corrosion proof and guaranteed not to break. Autoclavable up to 250F. Full width hanger lip supports heavy loads when suspended from hanging rails or louvered panels. Reinforced side-rib design adds strength and prevents spreading when stacked. Optimize your storage space. AkroBins are the industry-leading hanging and stacking plastic storage bin. Heavy-duty, industrial-grade polymer bins stack together or hang from Akro-Mils louvered racks and panels, rail racks, storage cabinets and louvered carts for high-density storage. AkroBins are corrosion-proof and unaffected by weak acids and alkalis. Quantum Storage specializes in storage bins manufactured using injection-molded plastic that is highly durable. Their bins are designed with front, back and side grips, which allows for easy handling, while a built-in rear hanger allows the bins to hang from louvered panels. 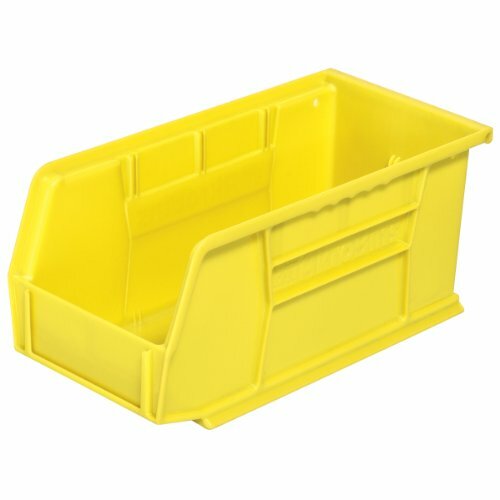 There is the option of ordering these bins with a clear plastic window, which provides a quick view of the contents without having to disassemble the bins. The bins feature large, molded slots where you can place ID labels for easier identification of contents. Individual dividers maximize flexibility and help to keep the contents of the bins organized. The bins have wide stacking ledges and anti-slide locks, which keep the bins steady and prevent them from shifting forward. Due to the bins being made of injection-molded plastic, they are resistant to rust and corrosion. Units are autoclavable up to 250-degree F, as well as being resistant to extreme cold. 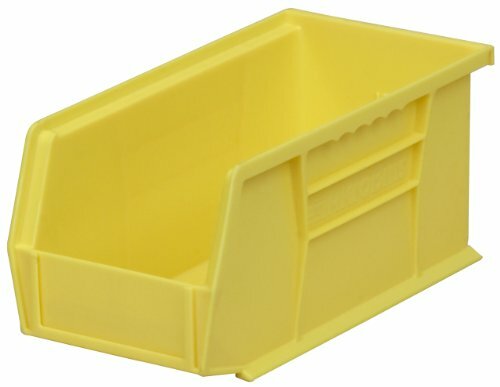 Strong industrial grade polymer bins hang or stack to accommodate your storage needs. Features include extra wide stacking ledge and finger grips for easy handling. Anti-slide stops and reinforcing ribs help prevent shifting and spreading when full. Large label slot provides quick inventory identification. Withstands 250F temperatures. 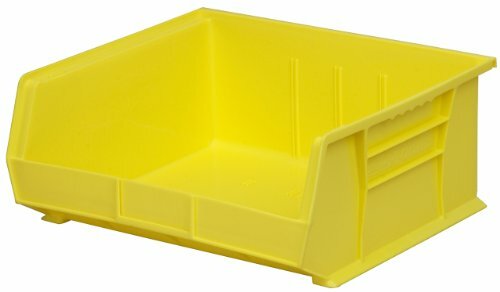 The Stanley 056400L #4 Nestable/Stackable Storage Bin is a single bin that is suitable for storing small parts or tools. The bins have a wide mouth design for easy access to contents, and can also be stacked or nested. Constructed with a high-impact, polypropylene construction. These are great storage organizers for the garage, closet, utility closet, etc. Individual bin size: 12.6" x 8" x 6". R.S. 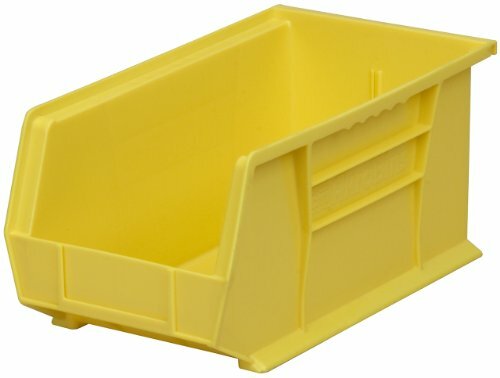 Hughes Company offers a huge selection of industrial supplies including this storage bin. Dimensions are particularly important when considering purchasing a storage bin. The dimensions for this item include: 16 7/8 in inside length, 20 in outside length, 16 9/16 in inside width, 18 3/8 in outside width, 11 3/8 in inside height and a 12 in outside height. Items within this category come in a variety of colors; this product is yellow. 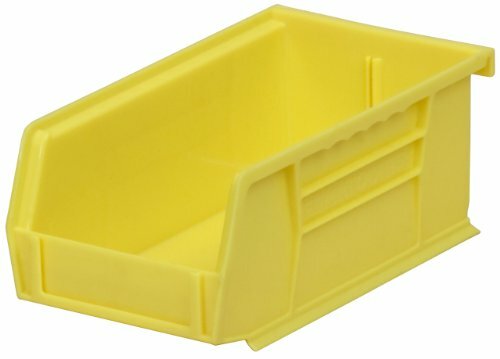 Storage bins can stack on top of each other, hang or sit on a shelf. This particular bin is a stacking bin. Capacity can also be an important factor when purchasing this item; the capacity for this item is 150 lb and a 300 lb. The material used in this product are: industrial grade polymer material. 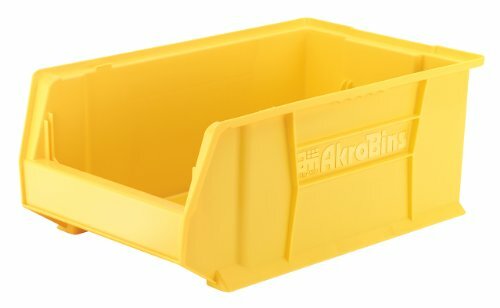 Store, sort and organize all of your bulky items with these AKRO-MILS Super-Size AkroBins. Made from durable polypropylene, sides are reinforced and will not spread under heavy loads. Use on shelving, carts and workstations. 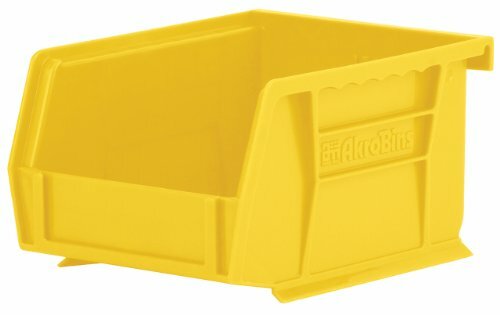 Bins feature: extra-wide stacking ledge to ensure a secure stack, extra-large front area for labels (not included), and molded-in rear carrying handle. Not recommended for hanging systems. Order bins in carton quantities specified, priced each. Appropriate for lean manufacturing. 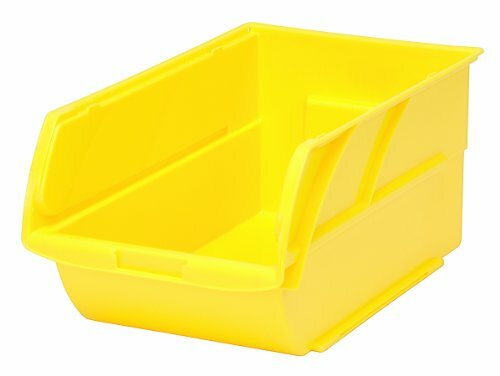 Compare prices on Yellow Stacking Bins at LiveSaler.com – use promo codes and coupons for best offers and deals. We work hard to get you amazing deals and collect all avail hot offers online and represent it in one place for the customers. Now our visitors can leverage benefits of big brands and heavy discounts available for that day and for famous brands. We try to makes comparison shopping easy with Product Reviews, Merchant Ratings, Deal Alerts & Coupons. Find Deals, Compare Prices, Read Reviews & Save Money.